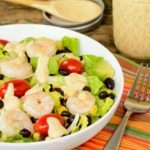 A recipe for Southwestern Shrimp Salad with crisp romaine, avocado, corn, black beans, onions, and tossed with a spicy Chipotle Ranch dressing. Divide the lettuce between two salad plates or bowls. Top with corn, beans, onion, avocado, tomatoes, and shrimp. Drizzle dressing on top. Serve immediately.